Submitted by Fred on Sun, 12/22/2013 - 3:07pm. The importance of experienced people using their know-how and ideas on how to continuously improve in our efforts to solve police problems while working together is of critical importance to police organizations. In the risk adverse cultures seen in today’s police departments throughout the country on of the key ways to continually learn and improve is from the mistakes we make. Yet all too often the systems in place shun failure as they seek a zero defects system. This zero defects system is augmented by a top down command structure that spends way too much time developing policies and procedures and checklists in an effort to prevent failure and very little time developing the people who need to address the problems as they unfold on the street. I have come to believe these efforts are noble but what are the unintended consequences when the best we can do is develop plans to be used for every situation when we know that yesterday’s situation will be totally different tomorrow and in need of a different solution? The fundamental problem is skill set to begin with. We are just not developing problem solvers, despite the belief in our professions that we are! Skills, policies and procedures and checklists work fine when circumstances are what they were designed to address i.e. technical problems. However we need an intuitive application of fundamental principles and allow discretion during the Golden Hour of crisis to pull order from the uncertainty and disorder ever so prevalent in crisis situations and police problems. Here we need adaptive people who can explore the situation as it unfolds and use their experience and know-how to apply a solution to the adaptive challenge they face. This requires people willing and able to probe, observe, orient, decide and act in real time to the novelties every situation presents. Yes we need fundamental principles and standards to solve problems but our purpose must be aligned with people and processes, if we are to solve adaptive challenges we face with the outcomes we seek. What type of problem was it (technical or adaptive)? What’s the root cause that needs to be eliminated or minimized? What was in the way that caused us not to reach the outcome we sought? Was it people, processes or both? These are just a few of the questions you may want to ask. The point is to explore all possible contributing factors and then based on your experience and the available information to determine what the causes and lessons are. But you need to dig deep for the root causes by asking why until you reach the root cause. “A relentless barrage of why’s is the best way to prepare your mind to pierce the clouded veil of thinking caused by the status quo,” says Shigeo Shingo, (who is considered as the world’s leading expert on manufacturing practices and the Toyota Production System). I think we in law enforcement should be doing a lot more of this type of analysis through after action reviews. It’s what learning organizations do. This is much more than just adding another bullet point to a procedure. Once we have identified the root cause of the failure then we seek collectively how it is we are to effectively eliminate, minimize or prevent the same causes or obstacles from reoccurring. Here is where you should elicit ideas from the street cop(s) who worked the problem in an effort find out what actions are needed to be taken to adapt the lessons learned. It’s important her for all involved to keep an open mind. As the old sane goes “The mind is like a parachute: It works better when it open. Don’t be afraid here to get a lot of ideas. This leads to the reality that in handling most adaptive challenges we face in law enforcement…you have options! Not just one way of doing things but multiple effective ways of getting the job done. Adaptive leaders take stock and see the value in failure. Adaptive leaders are self-aware and see both the pain and suffering and at the same time recognize the value in failure. Adaptive leaders find this valuable because they see failure as an opportunity to adapt in new directions. Is this not important while handling crisis situations that are so enveloped in the types of problems we in law enforcement face? Much more is expected of leaders today than at any time in our law enforcement history. Is it not time we do more than maintain the status quo and go beyond policy and procedure development and zero defects, and develop our people so they can grasp unfolding situations on the ground. Our purpose is driven by the values of character, autonomy, responsibility, initiative, working together, problem solving, adaptability and lifelong learning and are created and nurtured through our failures and the lessons we learn from them. 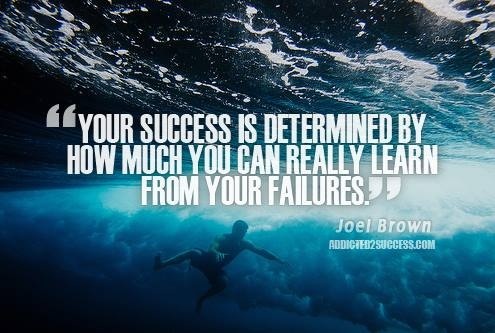 Failure is indeed our classroom all we need to do is see its value and then actually apply the lessons learned!